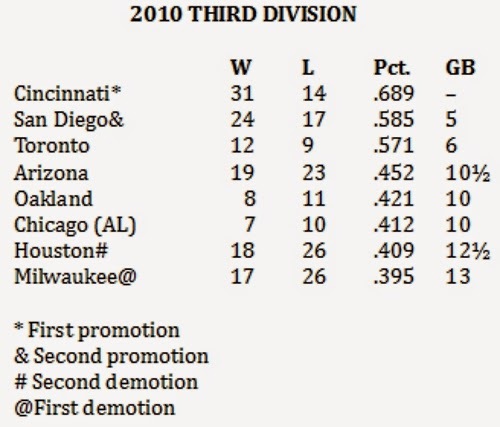 The Cincinnati Reds blitzed through the Third Division to win easy promotion to the Second Division for 2011. The San Diego Padres beat out the Toronto Blue Jays by one game to earn the second promotion. Going down to the Fourth Division in 2011 are the Milwaukee Brewers and Houston Astros. The Arizona Diamondbacks had a bad enough record in 2009 to be assigned the Fourth Division in 2010, but they won a tiebreaker with the New York Mets. Somehow, though, the Third Division suited the Diamondbacks. Although they finished their Major League season 65-97 for the second worst record in the National League, they finished 19-23 in this Third Division group and easily escaped relegation for 2011. The Cincinnati Reds, who won their first full-season Major League division since 1990, were the class of this group, earning the first promotion to the 2011 Second Division by five games. The San Diego Padres won a close race with the Toronto Blue Jays for the second promotion. On the bad side, the Houston Astros were starting their long downward slide and got themselves kicked down to the Fourth Division for 2011, but they didn't struggle in the Third Division quite as badly as the Milwaukee Brewers, the last-place team in this group and, therefore, the first to be relegated for the following season.